In Helen Dunmore’s The Betrayal we catch up with doctor Andrei, his nursery school teacher wife Anna and Anna’s younger brother Kolya, now a teenager and the source of much anxiety for his sister. The family first appeared in Dunmore’s Whitbread and Orange short-listed The Siege set during the harsh Leningrad winter of 1941-42. It’s now the 1950s and Andrei is working as a pediatrician. Like most Russians Anna and Andrei try to live as quietly as possible, avoiding anything that will get them noticed by the authorities. For Anna in particular this quiet existence means a great deal as her father was a writer who was not on the right side of the authorities and whose politics caused problems for the family. This peaceful life is put under threat when a colleague, Russov, asks Andrei to look at a child who has been admitted to the hospital with a suspected cancerous tumour in his leg. It’s a strange request because Andrei specialises in the treatment of juvenile arthritis, not cancer; then he learns that the boy, Gorya, is the son of Volkov, a high ranking official in the secret police. Russov, it seems is terrified of Volkov and fears the worst for Gorya’s health; anxious to pass the case on, he asks Andrei, whom everyone knows to be conscientious and devoted to his patients, to examine the boy. In spite of Volkov’s fury and initial unwillingness to believe the diagnosis, Andrei manages to convince the boy’s parents that the limb should be amputated and he recommends a colleague that is an expert in the field. Volkov, however, does not approve of the recommendation and wants only Andrei to look after his son. The amputation is carried out but the outcome is not straightforward, putting Andrei in a vulnerable position, at odds with a man known for his rage and who wields much power. With the same skill with which Dunmore captured the horrors of the siege of Leningrad she manages to catch the terror that people of 1950s Russia lived with. There’s a palpable feeling of paranoia running throughout the story that doesn’t even go away when Anna and Kolya flee to the family dacha. The shadow of Stalin is constant and even with his death at the end of the novel there is no real lightening of the atmosphere. What I always love about Dunmore’s writing is her ability to weave in lots of (not just historical) detail without interrupting the flow of the story and avoiding the pitfall of appearing over researched. In contrast with ‘The Siege’ the story is the main event here; the earlier novel was a more descriptive work in that it showed how people were forced to live during the siege, whereas ‘The Betrayal’ is more character and event driven. The characters of Anna and Andrei are a little colourless and in Kolya, who is now presented as a surly young lad who wants to hang out drinking with his friends, there’s a wasted opportunity to develop what could be an interesting character because the reader only hears second hand what he’s been up to outside the apartment. There’s something of a pantomime element to the characterisation and this simplistic ‘goodies and baddies’ approach is a bit of a let down because it makes the story quite predictable. There are a couple of characters that have a degree of ambiguity but Dunmore fails to develop them sufficiently. The story itself is not complicated but Dunmore’s ability to transport the reader right into the heart of her stories is what makes The Betrayal such an enjoyable read. She has a knack for choosing really interesting settings and sets to work evoking the ambiance through smells, sounds and emotions. The Betrayal is undoubtedly bleak but Dunmore’s details give it colour. I do hope that Helen Dunmore continues the story. I would be fascinated to know what happens to Anna, Andrei and Kolya in the wake of Stalin’s death. 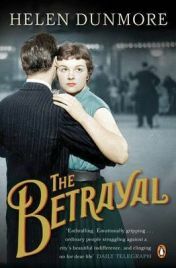 No Comments on "The Betrayal"